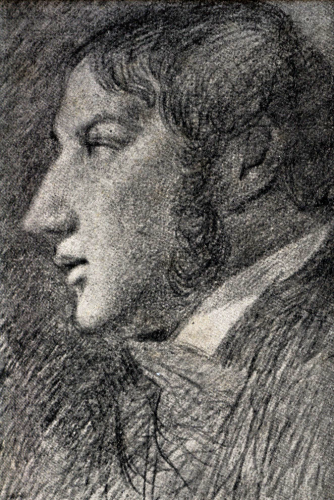 John Constable, Self-portrait 1806, pencil on paper, Tate Gallery London. His only indisputable self-portrait, drawn by an arrangement of mirrors. Brighton is having a bit of a John Constable moment this year. A beautiful exhibition of his seaside paintings runs at the Brighton Museum & Art Gallery from April to October and, during Brighton Festival in May, his former home and studio in the city will be an Open House - with artists making modern works inspired by his vivid landscapes. The enormously important part Brighton played in his personal and professional life is also being celebrated by the publication of a new book, about both the artist and the town itself in the turbulent 1820s. What brought all this about? Actually, a chance remark. When I moved to Sillwood Road, near Regency Square, a friendly neighbour welcomed me to the area; adding as an afterthought, “John Constable lived in this street once. He used to go off painting the beach all day.” Really? Surely Constable painted haywains and fields, not boats and seascapes? But I liked the thought of such a famous neighbour, and did a little research. It was easy to check the connection because Constable wasn’t only a great artist, he was also a terrific letter-writer. His published correspondence shows clearly that it was concern about his family’s health, not the beauty or otherwise of Brighton, that brought him down from London to the coast. His wife Maria had the lung disease TB. Their four small children were delicate, and the sooty air of their London home was doing none of them any good. Sea air was all the doctors of the day could prescribe, so…”We are told we must try the sea. On Thursday I shall send them to Brighton,” Constable wrote in May 1824. He followed them down a few weeks later, laden with paint box and canvases, and there they stayed until the end of October; Constable working in a makeshift studio that doubled up as a bedroom for the cook (“Mrs Inskip will cook for us for five shillings… and she says you may make use of her room and she can sit in the kitchen,” Maria told her husband) and spending hours painting and sketching on the beach on the Downs. The sea air worked - at first. It improved the health of Maria and the children so much that they returned regularly over the next four years, until Maria, weakened by three more pregnancies, finally went into a decline that nothing could halt. She died at the end of 1828 after one last sad and desperate visit to Brighton. Constable was left a widower with seven children under 12 to look after. There were no more carefree family holidays, when he was able to wander off to paint outside all day. But those four years when they regularly came down to “the dear old Sea,” as he described it, produced a wonderful body of work, and if he had been doing it from a studio in my road I wanted to know exactly where that studio was. So it was back to the fat volumes of correspondence where he described renting a small, newly built house, a few hundred yards from the beach. He told his friend John Fisher that his address was, “No 9, Mrs Sober’s Gardens – so called from Mrs Sober the Lady of the Manor,” but the exact whereabouts of Sober’s Garden seemed to be a mystery. “…An address unknown to the postal directories of the time,” as a footnote to his published letters puts it. Art historians had never pinned it down, but I knew exactly why my neighbour thought it was our street. My house deeds say that, in 1824, the land was owned by Mrs Ann Sober, sister of Thomas Read Kemp - Lord of the Manor of Brighton and builder of Kemp Town. Maps of the time confirm this, showing a row of small houses in the grounds of Mrs Sober’s house, Western Lodge, near Regency Square. Mrs Sober (Constable thought this a highly amusing name for a landlady) allowed the Constable family the run of these safely enclosed gardens in exchange for buying fruit and vegetables from her gardener. It was a haven for Maria, who in 1824 had John, aged six, Maria, five, Charles, three and two-year-old Isobel to care for and was pregnant again. There were also the obliging next door neighbours, mentioned again and again in the letters, the Masqueriers. That unusual name (Mr Masquerier was a French portrait painter) clinched the location. A land registry check of Sillwood Road deeds revealed Mr Masquerier had bought what was then 8 Sobers Gardens, and is today 10 Sillwood Road, in 1823, and lived there until his death in 1855. Other deeds showed the same number shift: 11 Sillwood Road was originally 9 Sober’s Gardens! At 11 Sillwood Road in the present day I found more artists. Peter Harrap, a painter and curator, and his wife Natasha Kissell, a talented landscape painter, had already established their own studio in the house before I told them rather casually that I thought Constable had beaten them to it by almost 200 years. The effect was electric. Harrap immediately wanted to prove the connection beyond doubt and joined the research with enormous enthusiasm. Once we made our case for the location he negotiated a Blue Plaque, which was unveiled by Richard Constable, the artist’s great, great grandson. A commission for Harrap to curate Constable and Brighton, reuniting works the artist undertook in the town, at Brighton Museum & Art Gallery followed. Now the exhibition is open and our book accompanying it is on sale, but the project continues to be an ongoing journey of discovery. And it includes a small mystery that readers of this magazine may be able to help solve. As Harrap traced the sequencing of Constable’s paintings, made on walks on the beach and in the local countryside, he realised that one of the great Preston Park elm trees might be the model for “Study of the Trunk of an Elm Tree”, Constable’s famous, almost photographic sketch believed until recently to be a Hampstead work. The V&A has lent the work to our exhibition but we are still looking for detailed drawings of the Preston elms and their surroundings at that time. If there are any early prints out there we would love to see them - they may help to make yet another important link between Constable and Brighton.